Home > Uncategorized	> What shared prosperity?! Not even during the Bill Clinton late 1990’s golden years? 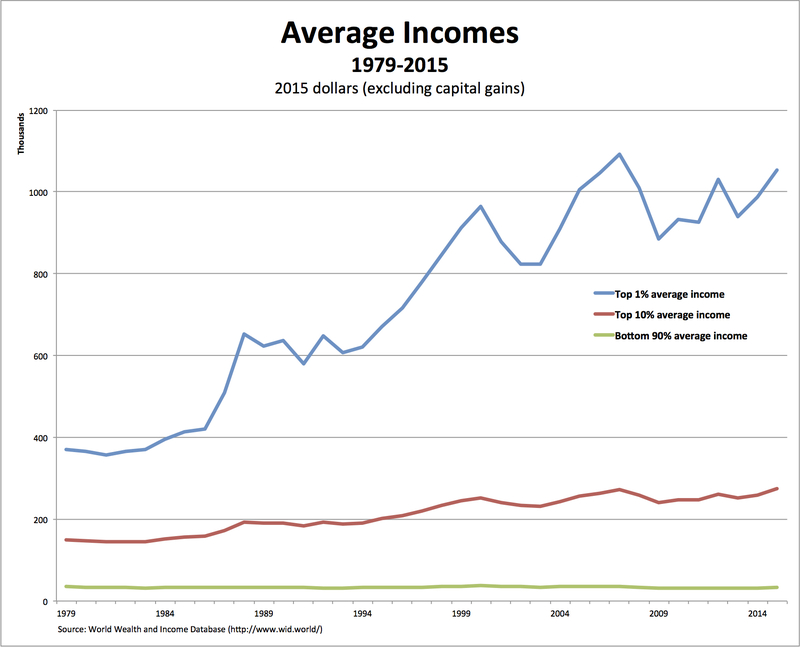 I thought it was generally accepted that there were some gains at the bottom of society in the late 1990’s. Why, exactly, that might be so isn’t clear. There’s bound to be a dispute over that but I’ll defer to those who slice and dice the data for the Roaring 1990’s. My own take on the “why” is the there was a spillover wealth effect for those in the service economy – waitresses and waiters, parking lot attendants getting bigger tips, not better baseline pay – which evaporated after the 2000-2001 bust…and what has followed. At the end, I’ll plead that I’m “just a student” in this controversy. As he was being deported from the US “Lucky” Luciano is reported to have commented that had he known how easy it was to make money legitimately in US he never would have become a criminal. Most historians have interpreted this as his complement to the openness of the US economy. I don’t agree. I think Luciano was noting the similarity between what he did to make money as a criminal and what “legitimate” businessmen did to make money. 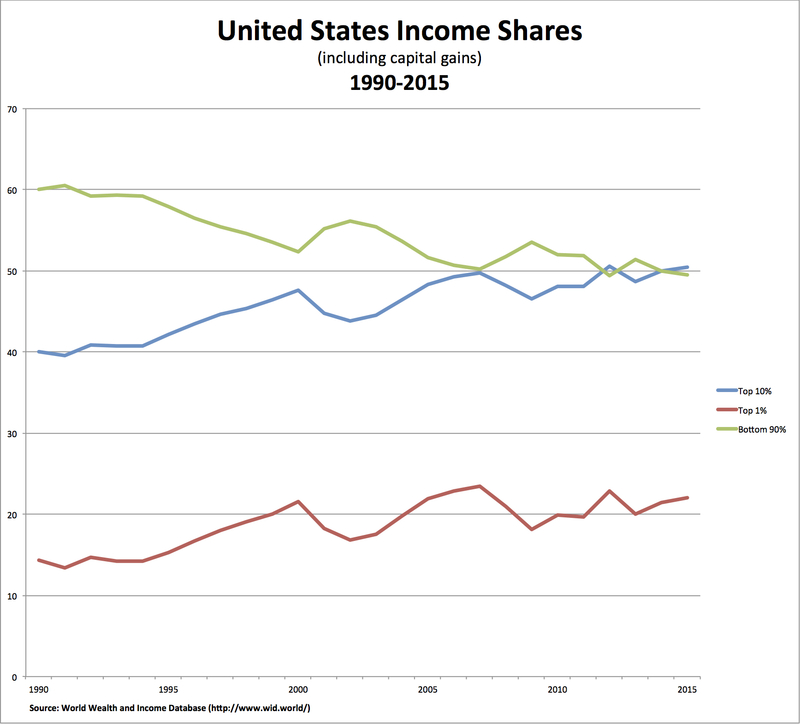 The rich are getting richer in the US because they’re taking from everyone else. Just like Luciano did. And like Luciano the taking by the legitimate rich provides little benefit in return. In fact, Luciano may have actually given more back than the legitimates he seems to have admired. No elaborate economic theories needed here. I just read that the gap between the rich and the poor in Germany has not increased in the past 10 years or so. I think this can be traced, in contradiction to America, to the existence of a stakeholder instead of a stockholder-director primacy conception of society. By all accounts and based on the few times they competed against one another Luciano was smarter and more nimble than Capone. Luciano wasn’t praising the American economic system. He was simply stating the results of his own observations. But at the time he lived choosing to be a legitimate business owner was not open to people like Luciano and Capone. It wasn’t even open to the Irish, like Joseph Kennedy, Sr. If they were to become rich is had to be through such enterprises as bootlegging, gambling, prostitution, and drug smuggling and distribution. And the competition was brutal. There are still bootlegger’s cemeteries all along the Canadian border, if any history PhD student’s looking for a dissertation topic. Just about everything involved in culture can be a racket, including the economies Economies of every shape create winners and losers. The winners want to keep on winning and the losers want to push the winners out of the way so they can win. Capitalism merely exalts and amplifies these tendencies.